August 7, 2013, 3:36 PM · Many theme park fans might know Jack Lindquist as the first president of Disneyland, a role he played from 1990 to his retirement in 1993. But Jack started working at Disneyland a few months after the park opened in 1955. Along the way, he developed or helped develop many of the practices and promotions that became Disney and theme park industry standards, including off-site ticket sales and after-hours special events. He even invented the Disney Dollar! It's important for theme park fans to recognize that theme parks operate they way that they do today not by some accident, but because innovative leaders such as Jack Lindquist (and last week's interviewee Marty Sklar) figured out how to make them work. Jack's written about his years working for Disney in his book, In Service To The Mouse: My Unexpected Journey to Becoming Disneyland's First President [$8.99 for Kindle], and he spoke with us this week. Like a great manager, Jack gives much credit to the cast members he worked with over the years, but Jack's willingness to embrace innovation surely helped establish Disney as the industry leader in theme parks for his generation, as well as for the next. Disney honored Jack as a Disney Legend in 1994, and, I hope, IAAPA one day will honor him with a spot in its theme park industry Hall of Fame. 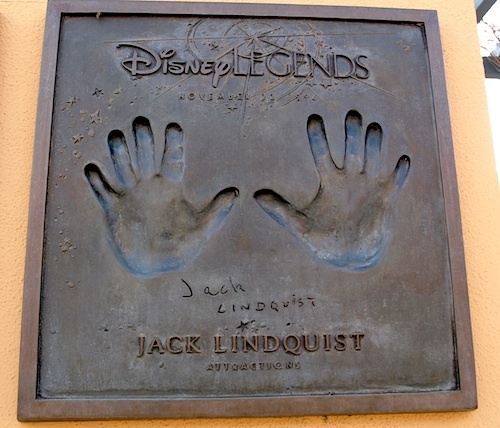 Jack Lindquist's Disney Legend plaque, on display at Diseny corporate headquarters in Burbank. Robert: You started at Disneyland as its advertising manager, just a few months after the park opened in 1955. Obviously, Walt himself helped sell America on Disneyland with his television show. But getting people from dreaming about a Disney theme park trip to actually buying their tickets take a lot of additional work. Along the way, you developed or helped develop many of the ways of doing that: off-site sales of tickets, special events, giveaways, even the "I'm going to Disneyland" commercials. How were you able to develop so many promotions that not only worked, but became standards for other companies to follow and imitate? Jack: I think it was I continually tried to find ideas that were different, that hadn't been done, that needed to be done, and to design promotions and ad campaigns around that. One of the best things we had going in the very early days of Disneyland was ignorance. We didn't know we couldn't do something, but we knew it had to be done, so we just went ahead and did it. There were no books to go by; there had never been a project like this before. So you just had to improvise, be intuitive. I just did what was necessary. After dinner, Michael came outside and found me and Tom Elrod, the VP of marketing at Walt Disney World. So Tom and I talked about we could use [the line.] We said there's a Super Bowl game in about three weeks: Denver versus the New York Giants, at the Rose Bowl in Pasadena. What if we had the MVP from that game, right at the end of the game, on the field, say 'I'm going to Disney World! I'm going to Disneyland!' Can we make that happen? We went to the NFL, went to NBC, and then we talked about who would be the MVP. We decided that the quarterbacks would be the best bet. So we went to Phil Simms and John Elway and their agents and started negotiating. We signed both of them, and as it worked out, Phil Simms was the MVP. We shot it as soon as the game ended, when they were on the field. And overnight, we got it to the Today Show, where we bought time for the next morning, as well as on Good Morning America and the CBS Morning News. And the thing that happened, it got picked up and ran on news shows all over the country, gratis. Then we went to the World Series and did the same thing. We went to the Indianapolis 500. We went to the NBA Finals. People expected those commercials immediately following a major sporting event. And it all came from remarks that a young lady made to Jane Eisner. Jane deserves all the credit for recognizing that was a great advertising line. Robert: Many fans might know you just as the first president of Disneyland, but you worked on projects in Florida, too, including the development of Epcot. In your book, you've got some great stories about trying to recruit nations to become part of World Showcase — stories that make me wonder how anyone ever gets anything done in international diplomacy. What's your favorite memory from the Epcot project? Jack: There are so many, but probably my favorite was the time we spent in Iran with the Shah. It was exactly a year before the overthrow of his regime. We spent five weeks there. He was very gracious; we met with him, his wife and his top leaders. I have no idea how ruthless he may have been as the ruler of that country. You felt an undercurrent — there were things happening, you didn't know what — you just felt it. The thing [the Shah] was most impressed with, though, the thing he kept referring over and over to us, was that when he took the throne after World War II, 98 percent of his people were illiterate. And just that year, reports show that over 52 percent of his people could read and write. He was so proud that 50,000 young Iranians were going, at the government's expense, to universities all over the world, and that they would come back and be the leaders of Iran in the 21st century. Robert: Well, he was right. Jack: Yeah, but he didn't see that side. World Showcase was an interesting project. For three years, I traveled over 300,000 miles a year, and visited 43 different countries. Robert: Later in the 1980s, you pulled off some epic giveaway promotions, for Disneyland's 30th and 35th birthdays. Everything from free tickets to cars. What made you develop those promotions, and why don't we see parks giving away stuff like that anymore? Jack: I don't know! [Laughs] I know why we did it, though. In 1985, that followed the Olympics in Los Angeles, which everyone predicted would be a boom for tourism, and turned out was a bust. The Olympics was a spectacular show, but it didn't drive hotel occupancy, theme park visitation or anything that we expected. So we were coming off about 9.2 million attendance for 1984, and we needed something to really highlight '85. I was sitting around thinking, 'Well, it'll be our 30th anniversary." Well, nobody celebrated a 30th of anything, but I said, 'Why not?' So I got started thinking that it's our birthday, but I want to give presents to our guests. I talked with a people inside and outside of the company, and the one single thing [people wanted] was automobiles. We went to General Motors, which was one of our new lessees at Epcot Center, and we worked out a deal with them. We gave away that year 106 General Motors cars, from Chevrolets to Cadillacs. We started with every 30th person won something, then every 300th, 3,000th, 30,000th, 300,000th, and three millionth. In my original memo to [then-CEO] Ron [Miller], I said that if we don't do 12 million people between Jan. 1, 1985 and Dec. 31, 1985, I'll resign. So he'll win if we lose. And we did 12,040,000 people. It worked. But it took everyone in the park to make it work. We totally computerized our entire front gate. We had Price Waterhouse underwrite the program, to give it the credibility it needed. We had to abide by all the federal and state regulations for lotteries and so forth. We had several hundred people win who never attended the park. We had a computerized turnstile set up [over by the kennel]. They went through it just the same as if they bought a ticket and went through the front gate, and if it hit one of those numbers, they won something. I think we had four of those people win cars, who never went into the park. Robert: So Disney Dollars were your idea? How did you make that happen? Jack: I was flying back from a trip to Europe, and you've got 11 hours' time to kill. I was going through my change, and there were francs, and Deutsch marks, and pounds, and so forth. And I thought, you know a lot of these countries we just visited, we do more people per year than their population. So why can't we have a currency? This was not some cheap promotion thing. I wanted a real currency. So we went to the Secret Service and we built in all the safeguards for counterfeiting. It was an expensive project, but we printed the money, and we introduced it in May 1985. I think we had 40 or 50 people standing in line, overnight, at the box office to be the first people to purchase Disney Dollars. One man, the first morning, bought $10,000 worth. I told him, 'I'll make you a deal. You go to the U.S. Treasury and tell them you're going to put a dollar in every box of Kellogg's. I will give you the same discount you get from them.' We never saw them again. Robert: You were one of the first — if not the first — advocate inside the company for building a second gate in Anaheim. What was your involvement in that effort over the years? Jack: I was the guy on the soapbox, starting in 1982, for a second gate at Disneyland. You can keep adding new attractions to the park, but you need to do something like Florida did with Epcot Center, a whole new park, something you can really make a fuss about, more than any new attraction. Disneyland was an aging property. A second gate was the most practical way to extend length of stay — and that's the basis for any second gate. So instead of a one, one-and-a-half day visit, you're going to stay three days. I felt that's exactly what we needed in California. I fought for that from 1982 until I retired, when Michael bought off on the concept of the second gate. I didn't [then] exactly what it was going to be, and it turned out to be California Adventure, which wasn't a good park when it opened. But in 2012, when they opened Cars Land, now it's a good park. Michael changed over the years. I enjoyed very much working with Michael from 1984 to 1993, and that's because he had Frank Wells. They were a great team. When we lost Frank, I think Michael really lost more than he could cope with. Robert: What's your advice to anyone getting into this industry today? What does a newcomer to this business need to know in order to have the same kind of success that you enjoyed during your career? Jack: You gotta like it. You gotta like it from the first time you see it. Then stick with it — you never know what's going to happen. I was very happy with the job I had for an ad agency, but I saw Disneyland, in May 1955, two months before it opened. Just looking at it, I fell in love with it. I had the chance to go to work there, and I jumped at it. I don't know why. It didn't make economic sense or geographic sense. I lived in Burbank. So for [the first] six months, I drove from Burbank to Anaheim, without a freeway. Learn everything you can. I never thought that marketing was the most important thing in the world. It isn't. It's everything working together. It's operations. It's maintenance. It's finance. It's legal. And today, all of those things are a lot more important than they were in 1955. It's the whole. Learn everything you can about every facet of how the park works. You can learn more about Jack Lindquist's Disney career through his book, In Service To The Mouse: My Unexpected Journey to Becoming Disneyland's First President [$8.99 for Kindle], or by downloading our complete, 40-minute interview with Jack [MP3 file, 38MB]. August 7, 2013 at 5:05 PM · The transition to a mostly cashless society eliminated demand for Disney Dollars, but some remain in circulation and, as Jack alluded, many are sitting around in drawers out there -- free loans to the Walt Disney Company. Themed currency still has its fans, though. I know I've heard several people know wish that Universal would do something similar in the Wizarding World of Harry Potter, creating Wizarding Galleons for use in Universal theme parks. August 8, 2013 at 8:23 AM · Mr Lindquist is to blame for the $70 or so worth of Disney Dollars that I have sitting in my collection! I buy a few every time there's a new version (if I make it to the parks), a $1, $5 and a $10 is actually a pretty reasonable souvenir. Money for nothing as Dire Straits would say. This is a great interview of a real pioneer in the industry. Hoping to buy the book! August 10, 2013 at 2:44 PM · I loved the New year's Eve parties at Disneyland!! That was my father's brithday and when I had enough allowance saved upped I would put that aside to buy us al tickets for his brithday to go there. I remember buying the tickets at Sears. My parents weren't much for crowds or theme parks but with the limited attendance for New Year's Eve they enjoyed going to the park. As for Disney Dollars, I have a few sitting in my drawer at home and I will probably keep them. My husband's family visited Calif. about 6 years ago and we gave their daughters Disnay Dollars to spend at the park; it was their 1st and only trip to a Disney park adn they loved it.